Here at Leytonstone Waste Removal, we offer a dependable and comprehensive service for all your waste removal needs. Whatever you require, be it house and garage clearance, garden clearance, office clearance, commercial waste removal, builders waste removal or even skip hire, rest assured at Leytonstone Waste Removal we have a solution. Not only does our fully licensed team offer a friendly, affordable same-day waste removal service, we give you complete peace of mind in that 80% of all the waste we collect is either reused or recycled. Furthermore, we provide you with a free, no obligation estimation, covering labour, dumping fees and transportation. Also, you only pay for the space in our vehicle you take up, ensuring there are no hidden costs and nasty surprises. There are more important things in life than spending hours traipsing to and from the local dump to get rid of your junk, so call us today on 0208 185 0510 or contact us online. We’ll do all the hard so you don’t have to! 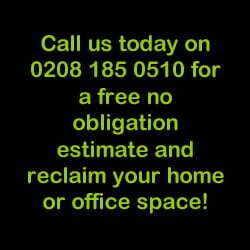 Give us a ring on 0208 185 0510 or book online. We book in two-hour slots, to ensure we come at a time that suits you and don’t leave you waiting around. We’ll give you a call an hour before we arrive on site, which will include your no obligation estimate. Remember, there are no hidden costs when you use our waste removal service. We’ll take away all your junk and clutter, and we’ll even sweep up afterwards! Thank you Leytonstone Waste Removal for a fantastic job! It is such a pleasure to come across a company that is willing to go the extra mile. You've made this customer very happy! Having never used your services before I wasn't sure what to expect but you made it all so easy and made light work of a job I had been dreading. I especially appreciated the care you took to clean up afterwards and leave everything spotless.